Where do we even start? We were swimming in a sea of AMAZING macro pics since we kicked off our Platypod Macro Photography Contest last month, and the submissions did NOT disappoint. GRAND PRIZE WINNER — Mushroom for the Win! Melanie: It’s easy to see why this image has won first place! The simplicity of the light and form, coupled with the technical perfection makes this image a winner. The shallow depth of field allows your eye to be quickly drawn to the subject. The back lighting causes the mushroom to glow, and the light from above gives us the sense that it is reaching for the heavens. The colors are slightly warm, which invites us further into the scene. And I love how the crop was not too tight. The mushroom has plenty of room to breathe, while not having too much space above it. It’s beautiful! The simplicity of the light and form, coupled with the technical perfection makes this image a winner. Zac: My favorite aspect of this entry is that the light source feels so strong on the mushroom to really make it pop, but the intense bokeh makes the sun almost disappear. It's a really cool effect! WINNER — Those Lips Though! T﻿his one had so many great comments on social media, so it was already making waves, pretty quickly, during the contest. It was a clear winner pretty early on. We just love Susan’s work! Melanie: This image is so interesting! This photographer took a subject that we see every day (a mouth) and took it to a macro level, while putting a unique spin on it. I love the color combinations of the orange peel, the lipstick and the skin. The tones all work beautifully together. The post processing is spot-on, leaving texture in the skin and lips. The lighting is beautiful as well. Great image! Zac: The color palette is amazing in this photo and I love how delicate the orange peel still feels. It creates a feeling of tension in the image where I am hoping the teeth don't close any further! WINNER — Bright, Beautiful, Bold Beta! Melanie: This was the last image I viewed and the second I saw it, I knew it was stunning. You can recognize that it is a fish, but the sensual flow of the fins and scales tells you that it could be something more special. It is abstract enough that it invites you to see it in a different way; it almost looks like a dragon’s wing. The colors are breathtaking and the movement sweeps me away. Subjects such as these can be difficult to light well. Light does not travel well through water, so one might be tempted to throw as much harsh light on it as possible. But this photographer used just the right amount of soft light to make it seem like a painting. A perfect image for me! This photographer used just the right amount of soft light to make it seem like a painting. Zac: Betta fish are often seen as very delicately moving animals, but this photo gives the fish a very strong and bold look! Larry: For the winner with the mushroom photo, I particularly loved the use of light and the translucence in the mushroom. 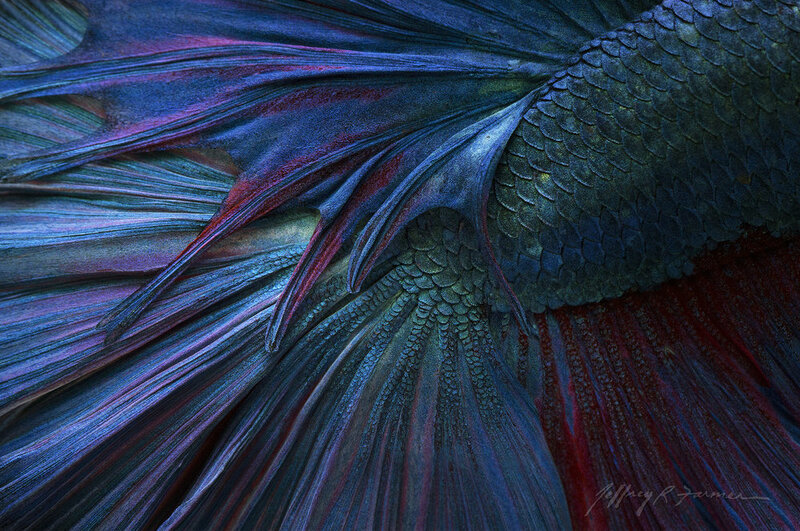 The fins and scales in the blue photo are a beautiful combination of the abstract and the obvious, and an outstanding study out of the red-green-blue-violet part of the spectrum. Outstanding composition as well. The orange zest bite has such a fascinating use of color shape and texture with the contrast between start white teeth and the beautiful brown, red and orange tones. Congrats to our winners! What did they win? Our Grand Prize Winner, Brian DeMeester, wins this Platypod Kit that is currently sold out online! We have one saved just for our Grand Prize Winner! Our 2nd- and 3rd-place winners will get a Platypod of their choice — Platypod Ultra or Platypod Max. We hope you guys love the prizes! We can’t wait to see you all at our next Platypod Photo Contest!